In the summer of 1864, two great armies engaged in a deadly, red-dirt minuet through the hills of North Georgia. Union General William T. Sherman, had his sights set on Atlanta; his opponent, General Joseph E. Johnston, had his sights set on Sherman. Their dance macabre halted on June 27 before the twin peaks of Kennesaw Mountain, near Marietta. Frustrated by weeks of non-decisive flanking movements, Sherman broke from form and hurled 15,000 hard western men against a well-positioned, deeply entrenched, foe. When the day ended in blood and rain, the troops who fought there would be forever changed by their experiences. Their story is told in a succinct battle narrative by veteran Civil War historian Earl J. Hess with clarity and dignity as befits the uncommon valor he describes. Hess's monograph reads like a staff ride organized by an officer intimately familiar with the area's topography, so important to the battle's tactics and the campaign's strategy. Maps and photos help provide a sense of place but readers without some familiarity of the Atlanta Campaign might become overwhelmed with the many gaps, ridges, rivers, roads, and creeks that define the geography of North Georgia. Hess recounts that the ball for this part of the campaign opened at Kolb's Farm on June 22. It was a small Union victory and John Bell Hood's attack drew criticism from other Confederate officers involved in the battle. But Hess concludes that “Despite the mistakes and the needless sacrifice of one thousand men...Johnston would have been forced to evacuate his Kennesaw Line on June 23.” Evaluating the larger tactical picture, Hess concludes that “Sherman once again was stymied in his efforts to compel the enemy to leave his Kennesaw Line.” The inconclusive action at Kolb's Farm prompted Sherman to try and break the logjam five days later. 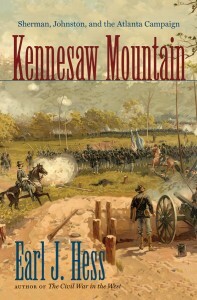 For the fighting men, Hess contends, “Kennesaw Mountain loomed large in the lexicon of battle as much for its challenges to the campaigning life of the common soldier as for the threat of injury and death from bullets or shell fragments.” By deftly interweaving his own piquant analysis with experiences recorded in diaries and letters of the combatants, Hess makes a convincing case for the importance of this still unappreciated battle and argues for a new interpretation of long-maligned Joe Johnston's tactics.